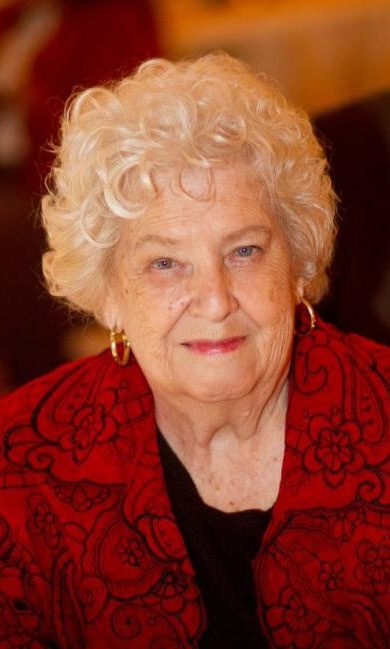 Ruth Brinton Hiatt, 91, passed away on August 10, 2015, in Mesa, Arizona. She was born in Douglas, Arizona on March 31, 1924, to Van Buren and Vida Driggs Brinton. Soon after her birth, her family moved to Mesa, where she grew up, attending Mesa Schools, and graduating from Mesa High School in 1942. She attended BYU where she met Rudger Hiatt, a fellow student from North Carolina. They were married in the Mesa Temple on May 17, 1944 and moved to North Carolina where he attended Duke University Medical School. They returned to Mesa and her husband eventually established a surgical practice in the Valley. Ruth was a founding member of the Lutheran Hospital Auxiliary, and also served in the Maricopa Medical Society Auxiliary. She was a member of the Mesa Desert Club and was active in her church, serving in many capacities. Ruth was well known as an amazing cook and for her fabulous parties with her Church group. She and her husband were also well known around Mesa for their hilarious “Clem and Odessa” Hillbilly act. They are the parents of seven children: Susan (Tom) Biggs, Phil (Roma Lee) Hiatt, Jan (Kent) Brooksby, Lisa (Deon) Caddy, Karl (Diana) Hiatt, Karen (Mike) Cutchen, and Nancy (Dale) Sabin. They have 38 grandchildren and 119 great grandchildren. She is preceded in death by her parents, and six of her siblings: brothers, Dilworth Brinton, Van Brinton, Robert (died in infancy) and Richard (died in infancy); also by her sisters Rula Flake and Virginia Whipple. She is survived by her youngest sister, Donna LeBaron. Ruth’s vitality and energy and loving service will be greatly missed by her family and friends. There will be a visitation on Friday, August 14, 2015, from 6-8 PM at Bunker’s Garden Chapel, 33 N. Centennial Way, Mesa. Funeral services are Saturday, August 15, 2015 at 10 AM, preceded by a visitation at 9 AM, at the LDS Chapel, 848 N. Westwood St., Mesa. Dear Nancy and family, I am so very sorry to hear of your loss. It sounds like your mother led a wonderful life! My prayers are with you all.